The Holy Church of “The Annunciation of Our Lady”, also known as “Evangelismos Tis Theotokou”, the historical and first Orthodox Church of Victoria, celebrated its Feast Day on Saturday 25 March. As the Church was severely damaged during last year’s devastating fire, the Feast of the Great Vespers was held at St John the Forerunner Greek Orthodox Church Carlton, on Friday 24 March, where Bishop Ezekiel of Dervis officiated at the celebration together with The Very Rev Fr Kosmas and many other Parish priests. The Divine Liturgy of the Annunciation of Our Lady, was celebrated at St Nicholas Antiochian Orthodox Church East Melbourne the following day, and was officiated by Bishop Iakovos of Miletoupolis together with The Very Rev Fr Kosmas. Priests, Board Members of The Greek Community and Parishioners were present to celebrate the Feast day. To assist with the reinstatement fundraising project of the Church, a variety of merchandise were sold and donations were accepted at both churches. 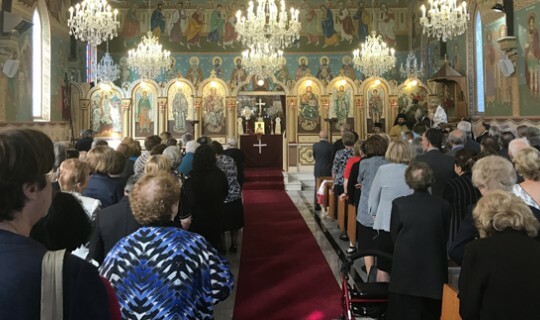 A special luncheon was organised by the Ladies Auxiliary Committee of the Holy Church of “The Annunciation of Our Lady” and was held at the hall of St Nicholas Antiochian Orthodox Church. The Greek Community of Melbourne would like to publicly thank Rev Jordan of the St. John’s Carlton parish as well as Rev George of the St. Nicholas Antiochian Orthodox Church East Melbourne for their kind hospitality.